A final morning wandering Old Havana. The National Museum of Revolution is disappointingly poor with amateur, dusty panels attempting to bring events to life, and failing. 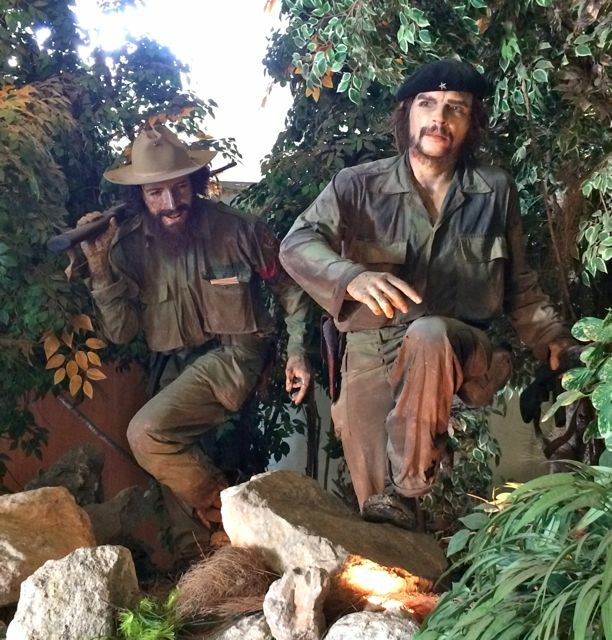 The diorama of Che emerging from the Cuban jungle was about as good as it got. Oh, and - for me - discovering that Che met the Castro brothers in Mexico City and that was where, in 1955, most of the revolutionary planning took place. By the end of the year, eighty two of them took a leaky boat to Cuba and, after three years of guerrilla fighting, ousted Batista and established a Marxist-Leninist government (not a Communist one, as Fidel Castro pointed out to American journalists at the time). Since then, apart from the flurry of big-time tension in the early 60s, Cuba effectively went into a kind of suspension. Che was assassinated in Bolivia while Fidel Castro remained at the top seemingly in perpetuity. He messed around in Africa. People got poor. Millions left. He stepped down in 2008. His brother took over and introduced a few reforms. Tourism increased and it became easier to get a passport. But it's still in a self-imposed time-warp. Hardly any internet and - for ill or good - the complete absence of MacDonalds and Starbucks.